Finance Minister Jim Flaherty and Stephen Harper are all over the media attacking European Union politicians for failing to take decisive action to deal with the "debt overhang", particularly in places like Greece, Spain, Portugal and Italy. This failure of political leadership they contend is at the core of the problems facing the world economy. Mr. Flaherty said a failure to adequately address Greece’s debt problems puts the global economy at risk, sharpening his criticism again as he and other top Canadian officials have in recent days. This is what you call missing the point. The problem is not the debt it is the undemocratic priority-setting imposed by global financial traders, ratings agencies and businesses. The same people who almost destroyed the economy in 2008 by creating an unregulated shadow banking sector that was little more than a giant ponzi scheme are now demanding the economic priorities of sovereign nations be determined by them. The lunatics are truly running the asylum. Not only has this crew demonstrated that it doesn't have the interests of the economy at heart, rather they are interested in wringing profits out of every pore of a country then moving on to the next. They don't care about investments in productive or socially necessary infrastructure. The determinants of good or bad, efficient and inefficient bear no resemblance to common sense understanding of those terms. It is entirely determined by their accumulation of wealth. But even that is really just a symptom of deeper problems. In Europe, it is true that Greece and some other countries have high levels of public sector debt. But it is to miss the point entirely - as I've argued more than once - to look only at public sector debt. It is total debt within an economy that shapes the likelihood of whether there will be investment to stave off a recession or protracted stagnation. In the USA the federal government has a debt of $14 trillion. That's a lot, representing about 100% of GDP. But it is dwarfed by the $36 trillion in private sector debt that has ensured that monetary policy - basically pushing down both long and short term interest rates to close to zero - has next to know impact on economic growth. There is literally no room left on the credit cards, lines of credit or mortgages of the nation. The parrot is dead. 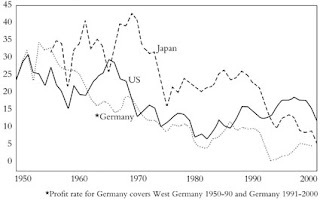 And total debt loads themselves are a reflection of the fact that profit rates have been falling almost steadily for the past thirty-five or forty years. In the first instance, the decline in profit rates led governments to embark on an assault on working class living standards that has led to stagnant or declining wages and the de-unionization of the workforce - most spectacularly in the United States where the private sector is basically union free. Experts say the seeds of this lost decade were planted long before the recession. Wages fell out of step with rapidly rising productivity and soaring corporate profits in the 1980s, and the gap has been growing wider ever since. The average real wage for working men is now lower than it was in 1973. But in an economy which is 70% consumer spending, this decline creates a roadblock to further growth. To overcome this workers were encouraged to take on ever more debt. Alan Greenspan kept interest rates low, fuelling speculative bubbles, first in tech then in housing, that gave the illusion of growing incomes. Inevitably, that bubble would burst and leave a wasteland of debt, foreclosed homes and unemployment. Since the decline in living standards was itself an expression of the problems in the core economy, it is not surprising that debt levels rose across the economy as a whole as profit rates stagnated. In particular, with pressure to move in the direction of a "financialized" economy, debt levels in the financial sector went through the roof. 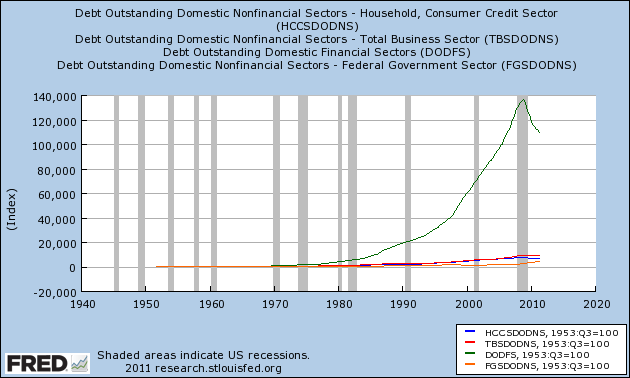 Looking at the graph of US data above you can see that while all levels represented - non-financial business debt, federal government debt, household commercial credit debt - have risen since 1953, they have risen astronomically in the financial services sector, particularly beginning in the early 1970s when profit rates really took a hit. If we look at debt in terms of billions of dollars, as opposed to comparing the change in levels over time, we see in a more pronounced form the very real reason for government debt. 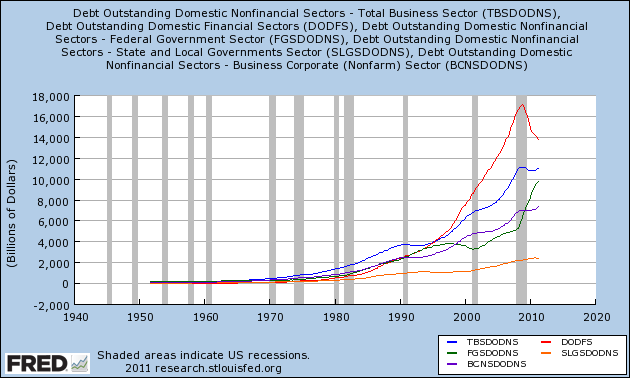 This graph includes financial sector debt, non-financial business sector debt, corporate debt, state & local government debt and federal government debt. As you can see, at the start of Bush Jr's term in office, federal government debt had stopped growing. Bush, of course, slashed taxes for the wealthy and ploughed money into foreign wars, which led to the return to deficit and debt growth. But, even with costly tax breaks to the corporate sector, business debt continued to rise - particularly financial sector debt. 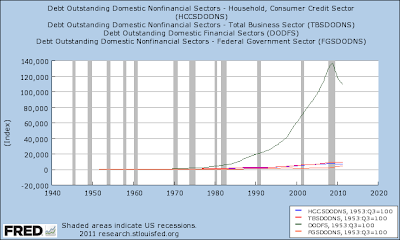 Now, look at the grey line around 2010, which indicates the 2008 financial crisis and recession. 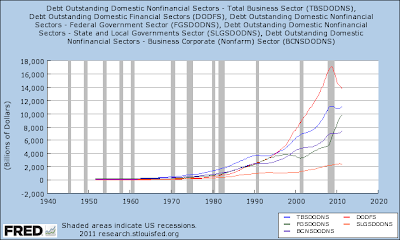 Notice how financial sector debt declines dramatically while federal government debt skyrockets? What this indicates is that the federal government saved the banking sector from itself by taking on toxic debt. This pattern was repeated in country after country. Those same bankers - who resisted all efforts to regulate them post-2008 (largely successfully) are now howling about the high levels of "sovereign debt." The upshot is that we are expected to pay for the disaster that they caused with further reductions in our living standards - that's what Flaherty and Harper are going on about: screwing us. The irony, of course, is that smashing Greece's economy into tiny little bits - and doing the same to every other economy upon which they've set their sights - will not solve the problems. They will make them worse. People will need more, not less debt, or they will simply stop spending, causing an economic contraction. They aren't stupid - they know this. The point of the austerity exercise isn't about economic efficiency per se. 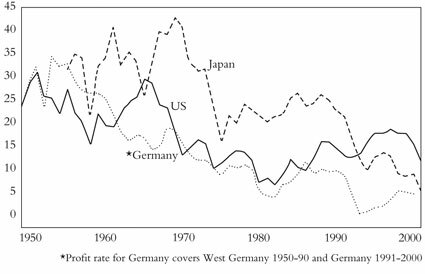 The hope of people like Flaherty and Harper is that a decisive defeat for workers in Greece and beyond will drive down living standards sufficiently to restore the rate of profit - which, in the graph above, can be seen on a long decline from the mid-1960s. The question is not whether their goal is about making us pay for their crisis. It is whether or not they will be successful.